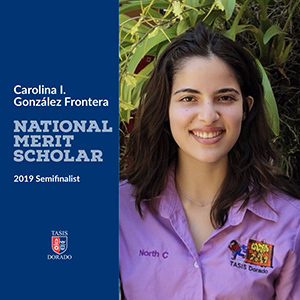 TASIS Dorado Senior Named Semifinalist In The 2019 National Merit Scholarship Program. To become a finalist, semifinalists and their high school must submit a detailed scholarship application, providing information about the semifinalist's academic record, participation in school and community activities, demonstrated leadership abilities, employment, and honors and awards received. A semifinalist must have an outstanding academic record throughout high school, be endorsed and recommended by a high school official, write an essay, and earn SAT scores that confirm the student's earlier performance on the qualifying test. Approximately 1.6 million juniors in more than 22,000 high schools entered the 2019 program by taking the 2017 Preliminary SAT/National Merit Scholarship Qualifying Test, which served as an initial screen of program entrants. The nationwide pool of semifinalists, representing less than 1 percent of U.S. high school seniors, includes the highest-scoring entrants in each state. Congratulations, Carolina! We are very proud of your accomplishments! It is a great day to be a BEAR!